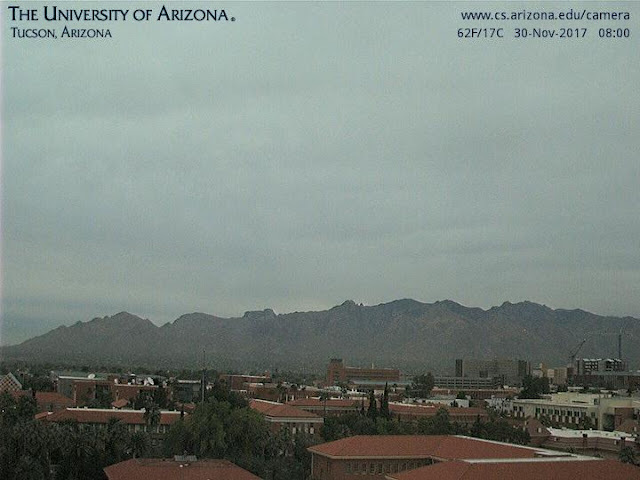 It's a dreary morning with thick, high clouds (as was yesterday) above is 0730 am MST visible satellite image and just below is the 0800 am view of the Catalinas from campus. Because of the thick clouds, low temperatures were considerably milder than recent mornings: 55 F today vs yesterday's 44 F here at house (airport was 9 F warmer this morning). Second below shows the "official" TUS observations this morning - i.e., in the record it is clear. 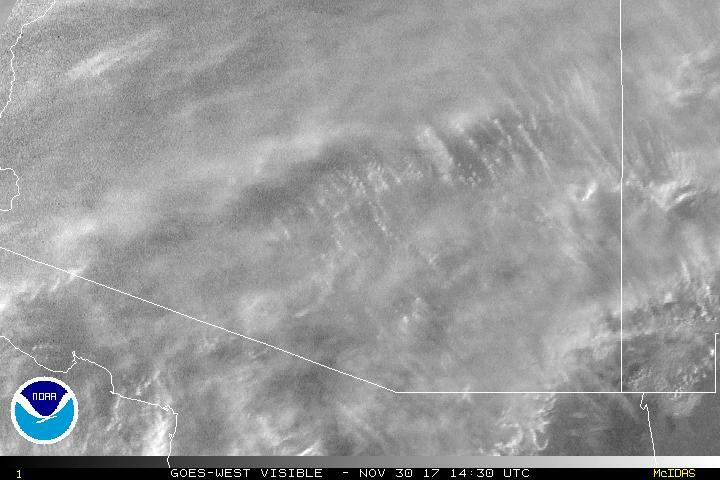 I show this mainly to emphasize some of the serious problems with the NWS automated surface observing system (ASOS). I took a look the local KEMX radar data (at College of DuPage weather page - link to right), where access to various WSR-88D products is considerably better than at TUS website. Shown above is the fourth tilt reflectivity (3.5 degrees) that indicates a fairly uniform cloud deck around much of the radar. Comparing the echo with the range vs height diagram below indicates that the clouds are based around 15,000 ft with tops up around 20,000 ft - these heights are above the radar which is a bit above 5,000 ft MSL (indicating clouds based at a bit above 20,000 ft MSL). Interestingly, this is one of those times when the 88D is a better cloud observing system than is the ASOS at the airport. Edited to add: The latest ECMWF 500 mb 168-hour fcst from 12 UTC below. Another ECMWF flip-flop, as per Dale's comment below! Another look at the global model operational, 500 mb forecasts at 168- hours (VT 00 UTC 5 December). I've put the GFS at top (it was better in the last two comparisons I did). The ECMWF is below. The ECMWF forecasts rebuild the 500 mb ridge along the west coast with a vengeance. The GFS ensemble forecasts have three members that are similar to the ECMWF; however, three other members have a strong, closed low around the Arizona/Mexico border. Predictability again appears low after 5 days or so. The 500 mb heights were amazing yesterday for so late in November - the 5920 m height at 00 UTC last evening (see above) was a record high height for the date. So, not surprising that the airport high of 92 F was both a record high for the date, and also the hottest ever so late in the year. Low here was 42 F this morning - around 13 F colder than up at the airport, so really big diurnal swings along the Rillito wash.
As for precipitation in the long range - I'll just point out that things are looking up - especially when one considers that the Winterhaven Festival of Lights is scheduled for December 9th through the 26th. We can almost always count on one very cold and very wet period during this festival. We've been away a couple of days in northern Arizona, where the main weather story was same as down here - record high temperatures. 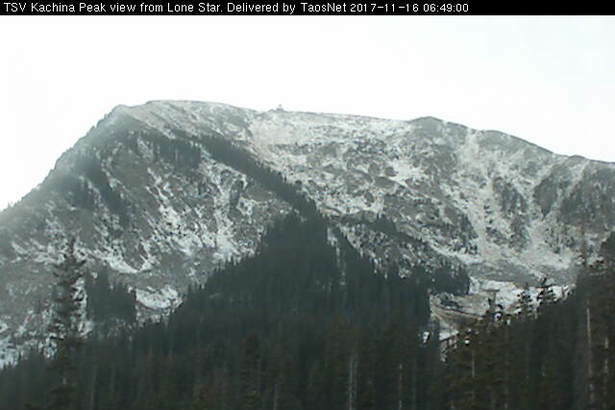 The miserable November pattern has continued over much of West - view above is of Jack Hale's snow stake at his Star Valley Ranch in northwestern Wyoming (elevation 6217 ft MSL) yesterday afternoon. 19th. No precipitation of course. The GEFS QPF plumes from 06 UTC last night are beginning to indicate some chances for rainfall at the airport during the first week in December. The short-wave at 500 mb crossing the Great Basin and Arizona tomorrow will bring us west winds - the ECMWF brings strong portion of trof farther south than other models, so winds could be stronger than currently expected - were this to happen. The westerly surface winds tomorrow will be followed by a period of east winds Tuesday night into Wednesday. After that we'll just have to wait and see how pattern evolves. Extreme dryness continues to continue. 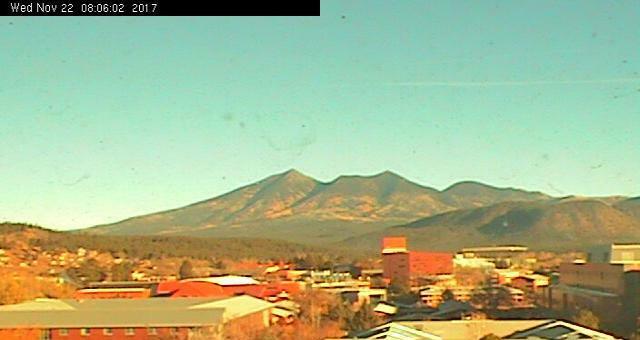 View above is of the San Francisco Peaks from ASU this morning - NSAA (no snow at all!). Below is the GEFS average 500 mb heights (with departure from normal) valid at 120-hours or 5:00 pm MST on Sunday. Departures from normal are depressingly high for most of West. Hope that all who visit here have an enjoyable Holiday weekend. In earlier post I mentioned how very different the ECMWF and GFS forecasts were for 00 UTC on 21 November. Here is a look at the final outcome. The forecast from ECMWF for 500 mb is above and the same for the GFS is at bottom. In the middle is the NAM 500 mb analysis for 00 UTC on the 21st - last evening. Very hard to make a call as to which model was better. The ECMWF was clearly closer to reality over eastern North America. Western North America and eastern Pacific were handled badly by both models. The ECMWF was seriously too intense and too far north with the Gulf of Alaska system, while the GFS was about the right intensity, but was too far south and west. The GFS was much in error over Alaska; whereas the split in the flow over Northwest and bowling-ball short-wave for Southwest were purely fiction in the ECMWF. So, just a good illustration of the inherent dangers of making routine seven-day forecasts! The operational GFS forecast above is for total precipitation through 5:00 pm MST on November 30th - not good. However, 500 mb heights build toward summertime values for the long Thanksgiving weekend. Low here at house was 40 F this morning - lowest minimum temperature so far this Fall. Lows during past 5 days have ranged 45 to 40 F. Previous coolest this Fall was 43 F on the 15th. Maybe into 30s tomorrow, but variable winds may lead to strong differences in am temperatures across the metro area. Any Rain Here Last Half November? For a change - sunset on 15 November - above. Operational GFS (from 06 UTC last night) forecasts almost no precipitation during next 10 days from west Texas westward to southern California. The GEFS plumes from same time remain flat-lined for TUS. Looks like we'll have to pin our hopes for a bit more rain on final days of the month. 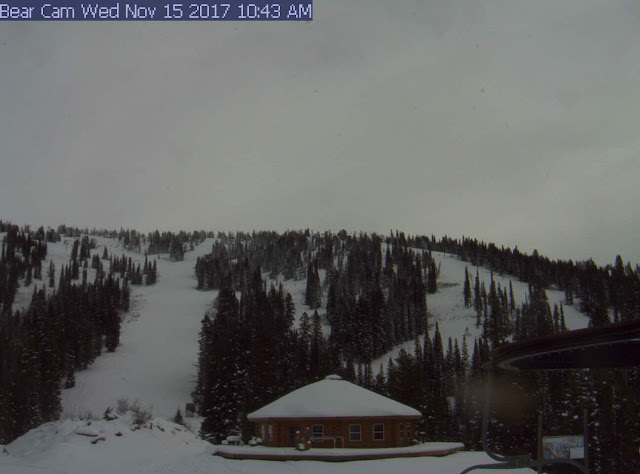 Finally, two ski area webcams for this morning. 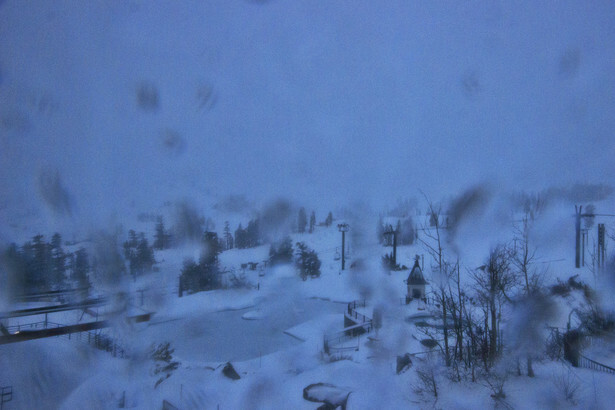 Squaw Valley, California, (above) looks very sloppy, while Taos Ski Valley (below) looks very skiffy. which goes to an NWS webcam site that has a tremendous number of cameras available. Below is a zoom to the SLC area, but user can shift around across entire country. It is quite an amazing site - warning: can be addictive. It appears the Bloomsky cameras provide all sky views, but I can only find summertime views, so that net may not be active currently. Below are three images I grabbed in the Northwest a bit ago. A ski area in Idaho above; two views along the west coast - one just north of San Francisco and the other at LaPush, Washington. The operational versions of the ECMWF and GFS are HUGE at 168-hours (VT 00 UTC 21 November), over both eastern North America and the east Pacific. Top graphics are the 500 mb forecasts and the bottom two are the surface forecasts. Note the surface pressure difference south of Anchorage - ~964 mb in ECMWF and ~ 991 mb in the GFS - quite something. The little bowling ball short wave that ECMWF forecasts rolling toward Arizona could also be interesting. We were at Santa Rita Abbey Friday afternoon and Saturday - no rain out there either. Two photos here of yesterday's sunrise. Mt. Wrightson through the cottonwoods (above) - which have not completed changed over to golden yellow yet. But after the heavy July rains brought amazing greens, the grasses on the hills are now fully brown (below). It is the time of the walking sticks out there - they migrate to window screens that face the sun from late October to early December, and then vanish for rest of winter. I assume that they are green during the summer, and then gradually change to gray/brown along with the grasses. 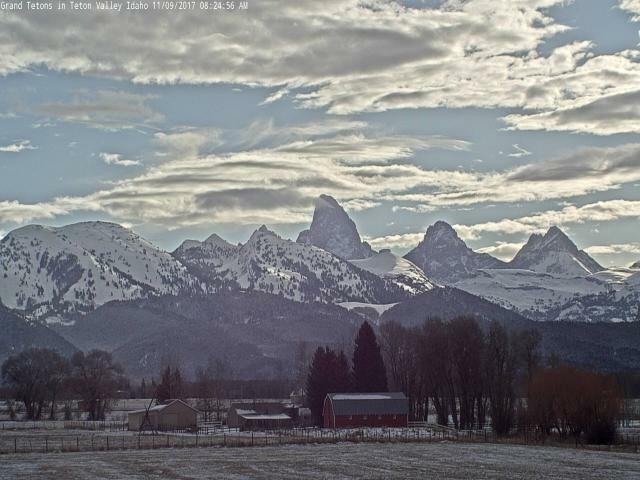 Above the Grand Tetons and below south fork of Snake River. 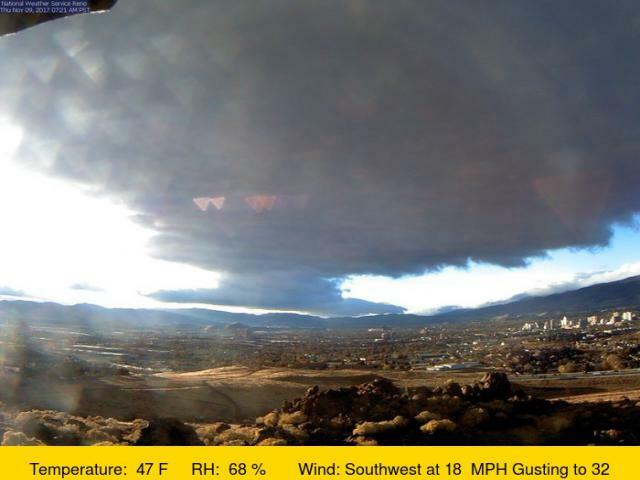 Reno with turbulent clouds and mammatus overhead above. 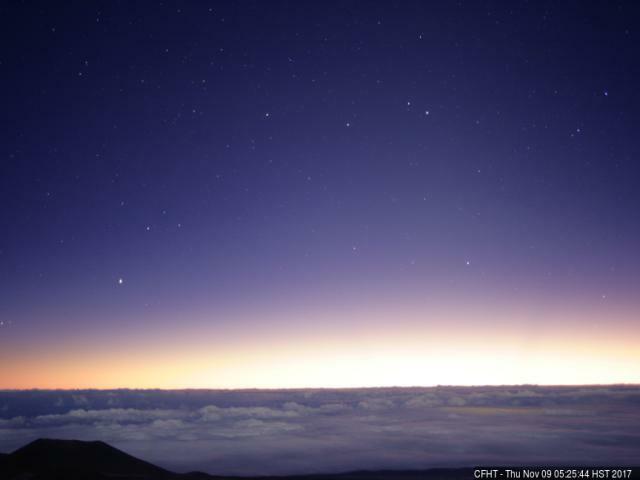 Below is from Mauna Loa looking toward the sun. Mauna Kea is to the left and I think that part of Orion is visible top center with Sirius trailing lower left. 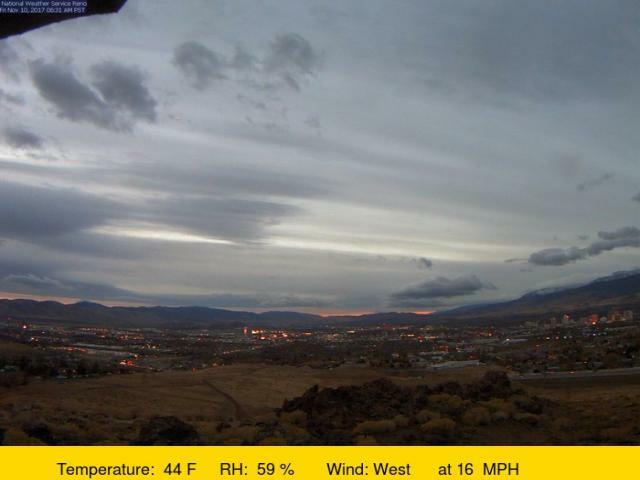 Above is Reno again with another chaotic sky. 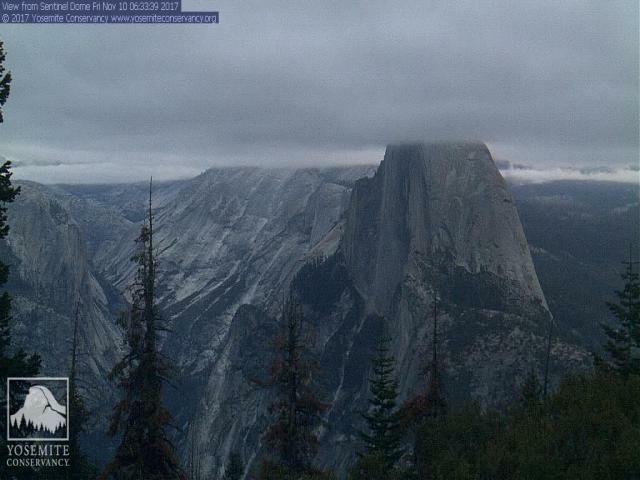 Below is Half Dome in Yosemite with it's dome in cloud. 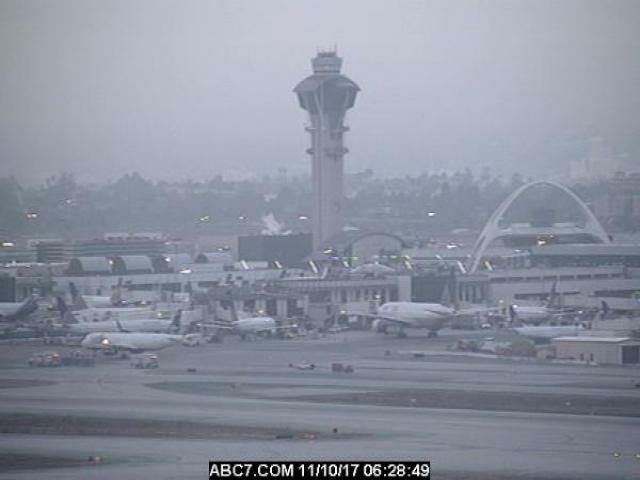 Dreary morning at LAX with some fog above. Below a look way to the south. 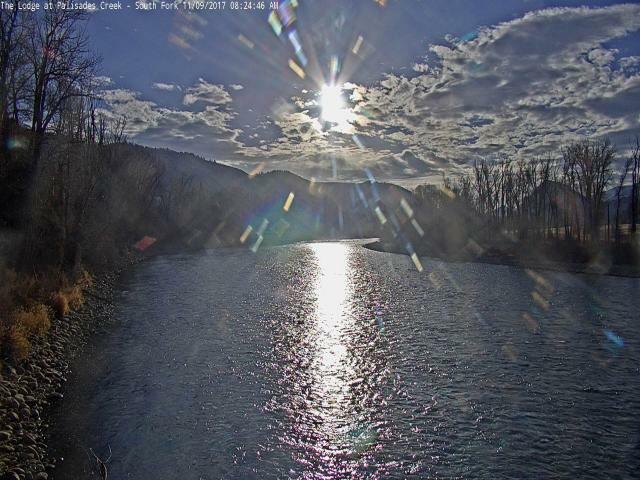 Purple sunrise today over the Rincons, with some nice ice crystal streamers. 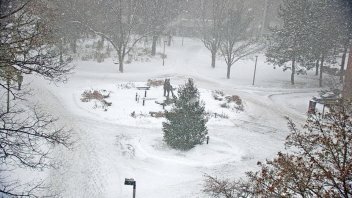 Snowy weather today confined mostly to far northern parts of CONUS. 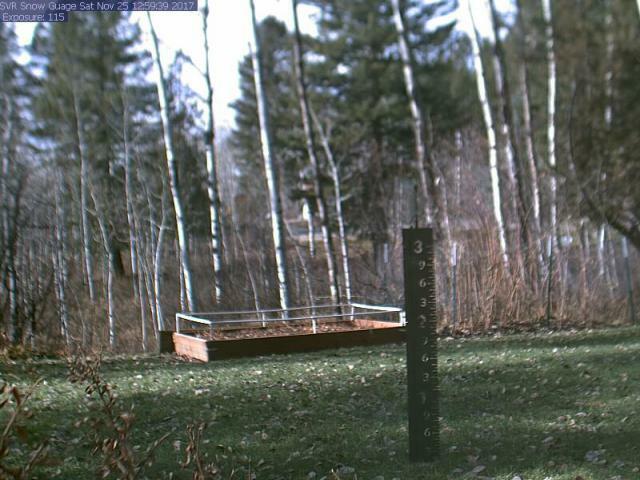 Webcam photo below from Michigan Tech in Houghton (Upper Michigan). 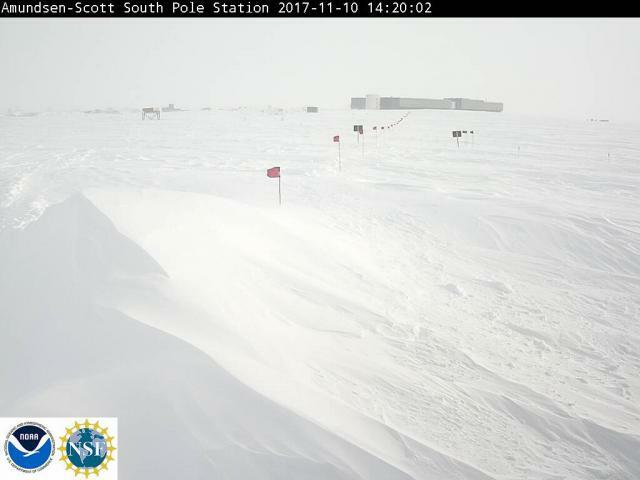 In desperation, I examined the long range forecasts out to ten days (that's of course very far out and we'll hope that models are way off by then), which is November 19th. The ECMWF operational spins up a tremendous blizzard for the Great Lakes region on day ten. In contrast, the GEFS ensembles have a huge spread for the Great Lakes at day ten. 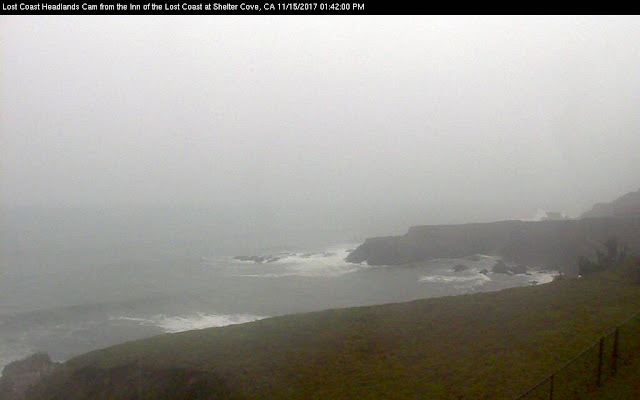 Big blizzard in member to the right above but fairly tranquil in member at left. I also looked at total precipitation forecast for the next ten days by the GFS operational - dismal rsults below. So it mostly goes since mid-August. 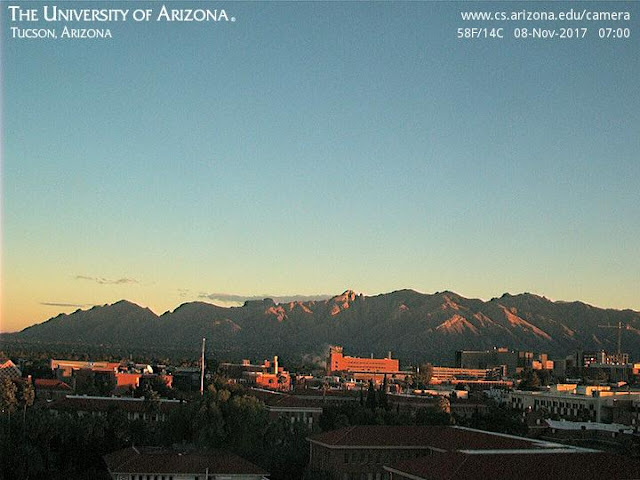 Clear, cool, and rain-washed air made for perfect walking conditions at sunrise today - 7:00 am MST view of Catalinas from campus above. Models had locked onto this event by the weekend, and it evolved pretty much as forecast - the WRF model was too wet for some reason yesterday. Amounts ranged from a Trace up to around a quarter of an inch - with heavier amounts south and east of us. The metro area got generally less than a tenth of an inch - above ALERT rainfall through 6:00 am. We had 0.05", which is first rain here since September 7th. Barely enough to dampen the ground along my walk, and definitely not enough to make a dent in what seems to me a fairly significant drought that has continued since mid-August. 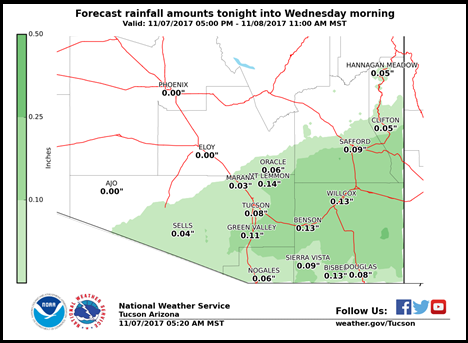 Below, from NWS web page, is a broader map of rain reports from southeast Arizona. Presumably the colored underlay is radar estimated rainfall - but there is no legend or color bar. The radar's terrain blockage problems are clear, as are the problems of radar-only rain estimation. Note that many stations under the heavier yellow colors appear to have had no rainfall. This is due to the base/hybrid radar scan getting into the ice layers in the clouds, i,e., combined problems due to blockage, range, and the precipitation algorithm. 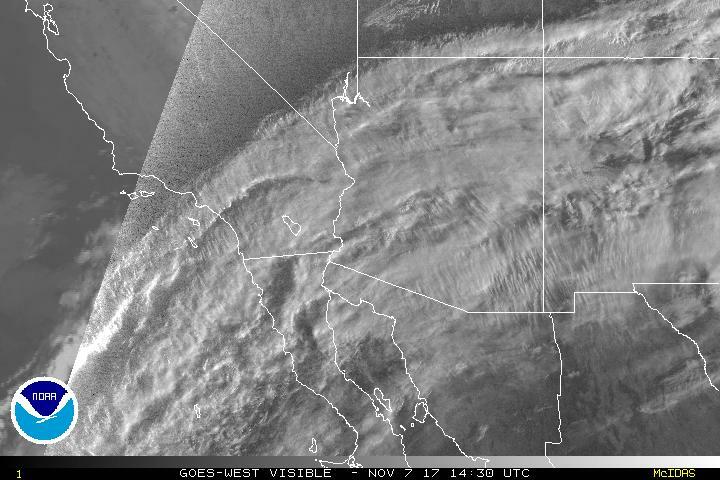 Heavy middle and upper-level clouds cover the entire state this morning, and models continue to forecast light showers this evening and tonight. From SPC (below) is their short range ensemble forecast for the airport (almost a quarter of the members forecast a tenth of an inch or more at the airport). Above is current NWS QPF forecast and below is same from 06 UTC WRf-GFS run at Atmo, which is most aggressive of the various model forecasts. Hopefully we'll have some rain in gauge for first time in many weeks.